Free tab and video rhythm study bass lesson for Triplets and Tuplets. 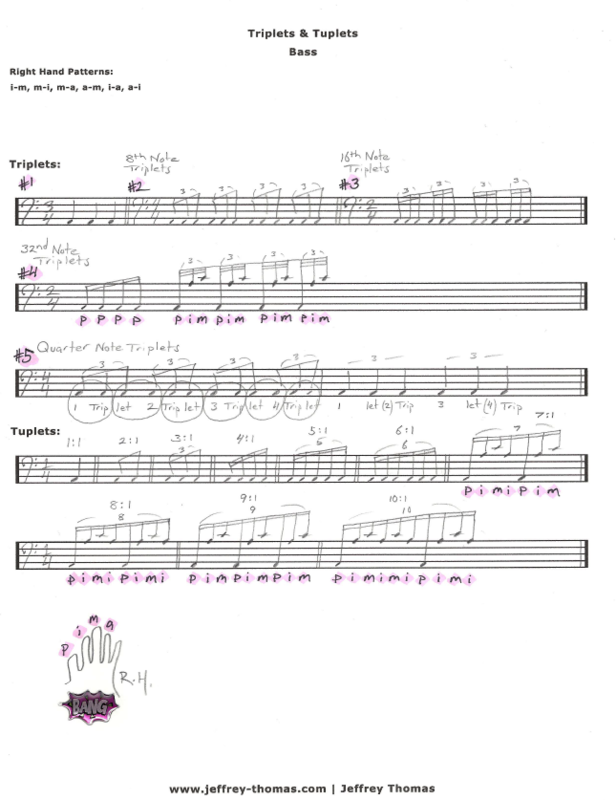 Learn how to understand the counting and playing of triplets and tuplets on bass. In this lesson I show the tuplet forms: 8th, 16th, 32nd & quarter note triplets all played and counted with a metronome set at 40 BPM. Tuplets explained as ratios from 1:1 up to 10:1. Right hand finger combinations and technique explained, counting and phrasing tips for all styles of bass playing. Want the bass tab for free? Just send in your email address using the form provided. Looking for online bass lessons? Fill out the Schedule A Free Lesson form to set up your free Skype bass lesson today. I hope this lesson helps with your counting and playing of Triplets and Tuplets. Make sure to check out my online video bass lessons page for more great bass lessons and tunes.